Who Can End Chronic Hunger? The sixth annual Dunk Hunger food drive for FeedMore’s Central Virginia Food Bank launches this month at pools all over Richmond. This program not only provides thousands of meals to our community, but also offers an opportunity for motivated teenagers to step up and be leaders. In 2012, I was thirteen when the first Dunk Hunger competition began. My mother asked me if I wanted to help her coordinate our neighborhood pool’s effort in the competition. I initially agreed as a way to earn community service hours for school and fulfilled the commitment with mostly manual labor, like helping supervise the food drives at home swim meets and carrying or hauling the food donations to the Food Bank on Rhoadmiller Street. After two years of helping my mother, I volunteered to coordinate the Canterbury Recreation Association’s effort by myself. Although my mom still helped me proof emails and drove me to the Food Bank, I organized and communicated everything. I led Canterbury’s Dunk Hunger effort in 2014 and 2015, and our pool won the grand prize each of those years. In doing so, I learned invaluable lessons about leadership, communication, and charity while helping our pool community provide over 24,000 meals to the hungry. Competition aside, this Dunk Hunger program provides the Food Bank with thousands of meals in the summertime, one of the hardest times of the year for the Food Bank because thousands of students in the Richmond area no longer receive healthy meals from school. This issue resonated with me. As a competitive swimmer, I eat a lot (my mother can confirm this! ), and the fact that kids my age didn’t always have enough to eat didn’t sit well with me. I wanted to help change that. I took this desire to make a difference and transformed it into passion while working to collect as many donations as possible at Canterbury. Dunk Hunger is truly a great cause, and the more a pool’s coordinator believes that and spreads the passion to their pool’s families, the more successful the effort will be. This is one of the most important skills I learned while running Dunk Hunger. It’s impossible to be successful if nobody knows what you’re doing. In addition to sending countless emails and putting fliers up around the pool, I spoke directly with kids and parents about Dunk Hunger, encouraging them to participate. At times, I called local business owners to schedule spirit nights. I wasn’t the most comfortable talking to adults when I first started; however, I learned to relax, and I developed better communication habits. A pool’s Dunk Hunger coordinator needs to be organized with his or her communication and possess the courage to speak with people of all ages. The job description is pretty open-ended: Collect as many donations for the Food Bank as possible. It’s a blank canvas for a pool’s Dunk Hunger coordinator to do anything to collect donations. At Canterbury, I created themed food drives such as “boys versus girls” or “support your favorite local college.” I worked with the swim team coaches to offer practice incentives for the winning group. The themed drives motivated the kids to remember their donations and want to donate more. In addition, I called local restaurants to see if they would sponsor a spirit night and donate some of that night’s proceeds to the Food Bank. This was a win-win for everyone on the team. Parents would tell me it was their excuse not to cook that night, and kids just liked running around the restaurant with their friends. Yes, the lines were often long, and the restaurant was chaotic, but it was all for a good cause. There are so many different ways to fund-raise. Successful Dunk Hunger coordinators just make it fun. People ask me all the time what made Canterbury so successful in winning Dunk Hunger. It had nothing to do with our swim team size, or wealthy members, or secret fundraising strategies. It’s the people. Every kid at Canterbury was inspired to help make a difference in our community through Dunk Hunger. For example, I was supervising a food drive at a swim meet one year and a parent came up to tell me how her two children asked her earlier in the day if there were any extra chores around the house they could do so they could have a few extra dollars to donate to Dunk Hunger that night. Another time, a group of 7-year-old girls came up to me and volunteered to give free pedicures to anyone who brought a donation for Dunk Hunger. The level of inspiration the kids at Canterbury demonstrated was simply unparalleled. I would like to think that I was just as charitable when I was their age, but I wasn’t even close. Their charitable acts inspired me and taught me an even greater lesson on the importance of charity. For those kids to know how important giving back is at such a young age is amazing. RFM and NOVA partner annually to end chronic hunger and raise food and funds for FeedMore’s Central Virginia Food Bank. Overall, organizing the Dunk Hunger food drive for my pool was a priceless experience for me. I highly recommend it to any teenager who wants to take a leadership role and do something significant with their community service hours this summer. There’s no set time commitment – you can work when you want, and put as much effort into it as you want. 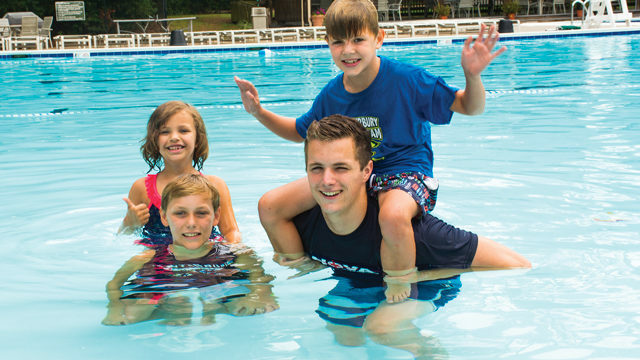 If you think this is something you would like to do, talk to your pool director, and make it fun for others to give back to families all over Central Virginia through FeedMore and Dunk Hunger this summer. Every meal and every volunteer makes a difference in our community. To sign up your pool or to make an online donation in support of Dunk Hunger, go here. Next articleMake a Jump Rope! 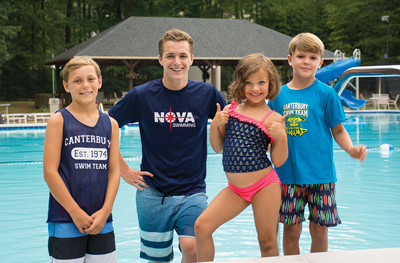 Jack McSorley has been swimming with NOVA for eight years. He lives in the West End with his family, and will attend and swim for Cornell University in the fall.